The SMARTPLY OSB3 T&G comprises of cross oriented layers of fl akes of selected softwood timber bonded with synthetic resins and waxes. OSB 3 FR is manufactured in accordance with the requirements of I.S. 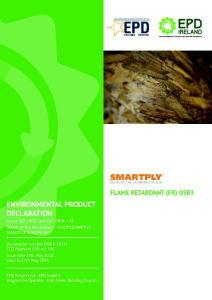 EN 300:2006 Oriented Strand Panels (OSB) – Definitions, classification and specifi cations. SMARTPLY FLAME RETARDANT (FR) OSB3 is a structural, moisture resistant SMARTPLY OSB3 panel with reliable reaction to fire properties. Ideal for use where strength, moisture resistance and Euroclass C or Euroclass B* fl ame retardance are paramount, the OSB3 panel complies with the European reaction to fi re classC-s2,d0; and BFL-s1.